Welcome! St. Anastasia’s Parish Library is sponsoring a book club, which I will be facilitating. In order to encourage greater community participation, I will update which books we will be reading here, and encourage anyone who is unable to make our monthly meetings to read along with us and join us on this online discussion forum by commenting below. 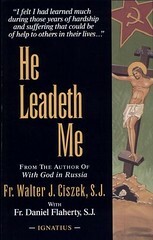 This month’s book will be He Leadeth Me by Walter Ciszek. Here is a recommendation for the book by Jennifer Fulwiler, a recent convert to Catholicism, who has an excellent blog at Conversion Diary. This stunning autobiographical account of Fr. Ciszek’s wrongful imprisonment in Russia is one of the most life-changing books I’ve ever read. I read it more than a year ago and yet I still find myself thinking about it almost daily. What was most surprising to me was how applicable the lessons he learned are to modern American life. His insights about everything from suffering to discerning God’s will to trusting God in all things — which he learned the hard way during five years of brutal solitary confinement and fifteen years in a Siberian death camp — are amazingly inspiring, whether you’re experiencing great suffering or just feeling numbed by the daily grind. I particularly loved his thoughts on how to maintain a lively spiritual life even when life feels mundane or boring. I highly, highly recommend this book.